Speaking of the Mix Meat blog. 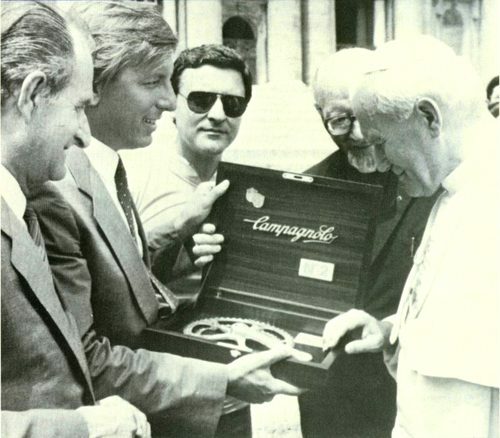 They’ve got some classics in there, like this one of Pope John Paul II accepting the Campagnolo 50th Anniversary group number 002; group number 001 is in the Campagnolo factory. 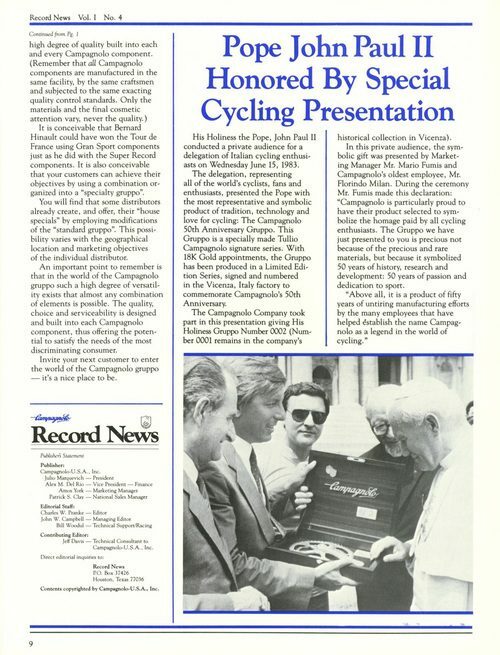 (I had this image in a bike dump folder on my computer, so I uploaded my version instead of theirs, which is higher resolution) For the article from the Campagnolo Record news, check below. No idea where I pulled these from originally, but I’ve had them on my computer for a few years. The Pope put his group on a custom white Colnago. This is also when Cinelli designed the first Priest Bars to make his Colnago more comfortable for riding. I had a pair of the 2nd production run on my Merckx for a little while. Cinelli eventually took the initiative to re-issue the Priests in the form of the 31.8 OS clamp Valencia bars.